Experimental dance artist Kyli Kleven performs 3 nights of Triangle Theory: a dance-based preoccupation with the meaning and depth of shape-making, specifically of making meaning with/as triangles. Triangularity supports a dance fantasy, a nameless skill, and a delicate legacy of how a line, a shape, or a time-space structure is. 2016 is the 30th anniversary of Wendy Carlos’ release of Beauty in the Beast, the American Dance Festival shirt worn in Good Will Hunting, and of Kyli Kleven. 100 years ago the suprematists were lost in a desert of feelings, Oskar Schlemmer made a Triadic Ballet, and a tripod was first erected in Nenana, Alaska, which, every spring since, has floated down the broken Tanana river pulling a line of triangles behind it. Kyli Kleven is an experimental dance artist and video artist based in Brooklyn. She owes much of her point-of-view to her participation in the art-making practices of Kim Brandt, Ryan McNamara, Jillian Peña, Milka Djordjevich, Jen Monson, Jen Rosenblit, Jen Allen, Kirstie Simson, and many others. 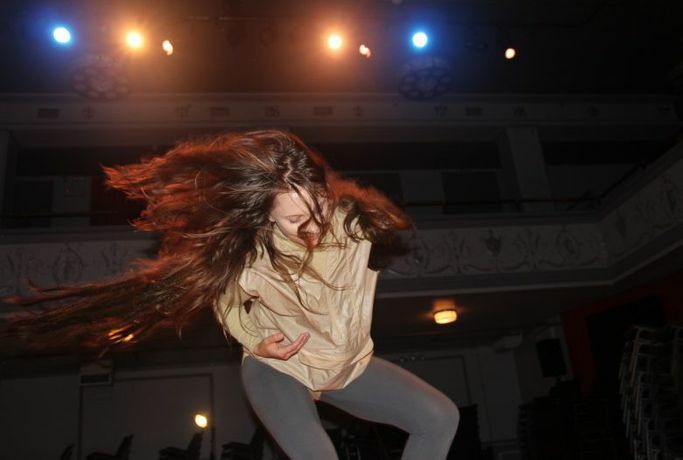 She also worked extensively with Our Dads, a dance-making collaborative project with Stevie May, Tess Dworman, and Caitlin Marz (2010-14), and as a video artist for knitwear designer Stephen West (2012-Present). She studied dance and gender studies at The University of Illinois at Urbana-Champaign, and was a 2008 DanceWEB scholar at ImPulsTanz. She is honored to be installing this personal work at Roulette, a very personal place, where she has worked since 2011. She started life in Nenana, Alaska. The ongoing [DANCEROULETTE] series reflects Roulette’s commitment to presenting experimental dance held since the organization’s founding in 1978, particularly the collaborative efforts of composers and choreographers exploring the relationship between sound and movement, choreography and composition. Kyli Kleven: Triangle Theory is made possible, in part, with funds fromGENERATE: The Frances Richard Fund for Innovative Artists of Promise supported by Roulette’s generous donors.